April 1st, 1945 was the Battle of Okinawa in World War II. It was an Easter Sunday, just like today. It was the day that my dad, Floyd Whiteman, was injured in World War II, earning him the Purple Heart. A kamikaze plane dropped a 20mm tracer shell on the auxiliary engine room escape hatch cover. Dad was a radio man on the ship, repeating the captain’s orders over the horn for his shipmates to hear. Of the four men and one dog wounded, Dad took the brunt of it. Five men tried to hold him down while they took the shrapnel out, having run out of anesthesia. To his dying day, Dad still had shrapnel in his leg. I present to you an excerpt from “The Unofficial Log of George W. Freshwater SoM2c, PCS-145”, one of my dad’s shipmates. This was his account of the attack. Another account came from “The Wartime Journal of Richard Scovil, PCS-1455”, another of my dad’s shipmates. “Apr. 1, 1945 – It is Easter Sunday and April Fools Day, but for us it is D-Day on Okinawa! This is the biggest invasion in the Pacific and may even be bigger than the invasion at Normandy. The sky is black from a morning of gunfire on an otherwise beautiful day. The sea is like a mill pond, so glassy we don’t even roll. So far there has only been one Jap plane overhead and he was shot to pieces. I suppose tonight we will be under continuous air raid warning. So far we hear the resistance is light and the troops are moving in rapidly. We can see two radio towers in Naha, down the coast a couple miles. For once we are a control vessel but we aren’t half as busy as we thought we would be. 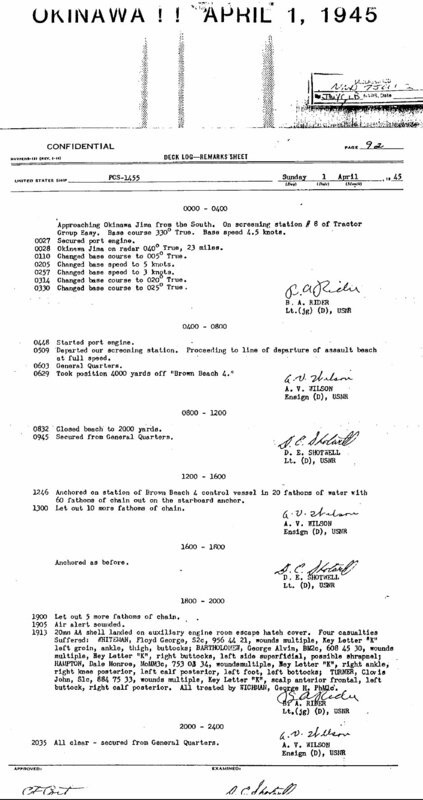 You can read the ship’s log regarding the Battle of Okinawa here. Here’s to the brave men (and one brave dog) who served aboard the USS PCS-1455.